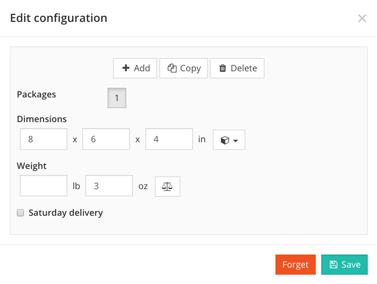 The Configurations tab allows you to manage the memorized shipping settings for the various item combinations that you have shipped previously. Filters: You can filter what is shown in the configurations table by sales channel. Search: This allows you to search for configurations by their sales channel, item contents, and more. Store: The name of the sales channel that the items in the combination belong to. Dimensions: The length, width, and height of the package(s) as configured for the combination. Weight: The weight of the package(s) as configured for the combination. Packages: The total number of packages that make up the combination. Frequency: The total number of times that the combination has been shipped. You can quickly edit any configuration shown in the table by selecting the Edit button next to it. This will open the Edit configuration dialog window, where you can tweak any of the configuration's memorized settings. The available options to edit include the number of packages and the dimensions and weight for each package. Once you have made your desired changes, you can Save the modified configuration. If you want to remove the settings for this configuration entirely, you can select the Forget button.